Allison: "One of my favorite local foods was komba, the steamed fruit of marita pandanus. 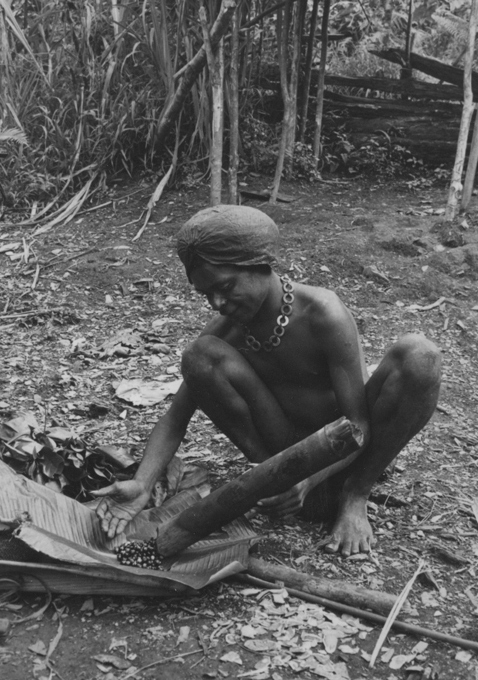 Even before we arrived in the Simbai Valley, the Rappaports had told us about the delicious red sauce made from the flesh that surrounded hard seeds lined up on what looked like a huge corn cob. They described it with difficulty, concluding that it was something like a salty chocolate sauce. We were both eager to try it." 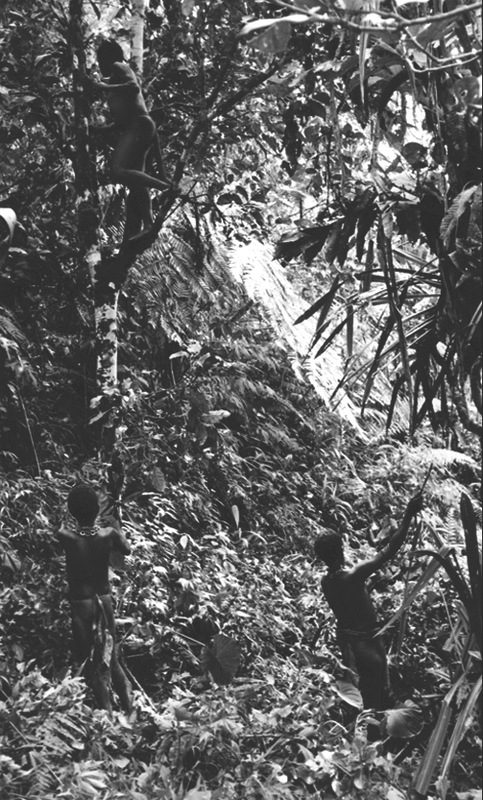 The marita pandanus grew in groves on the steep lower slopes below Gunts. 049-05: Minme, Kum and Tukume in a komba pandanus grove. One day I accompanied Minme and her daughter, Kum, down to their grove. Tukume came along with us. 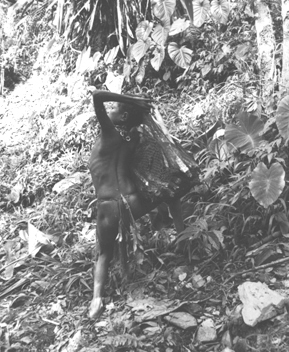 As soon as we arrived, Minme climbed a nenk tree to pick the edible leaves. Kum was already looking upward into the pandanus trees to spot a ripe fruit. 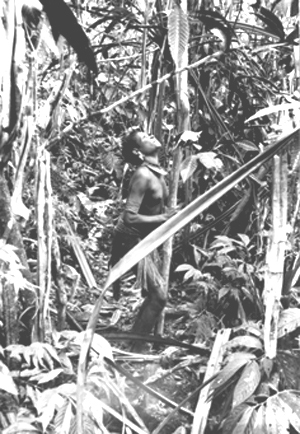 A huge bamboo pole had been left in the grove specifically to be used to knock down the fruit. Unlike most of the trees whose leaves the Maring used for food, pandanus protected itself not by height, but by the almost thorny texture of its bark. 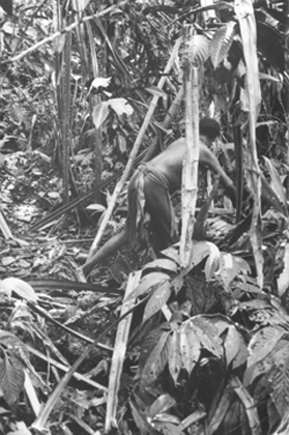 It was impossible to climb and not at all easy to dislodge the two-foot long fruits. 049-19, 049-23: Kum pokes a marita fruit high above her head and then fetches it from the undergrowth when it finally falls. 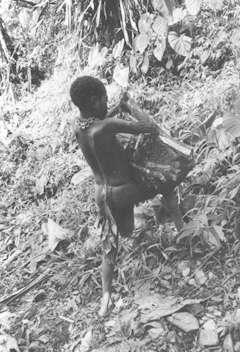 Tukume, meanwhile, had been collecting sticks from the forest floor to take home for firewood. 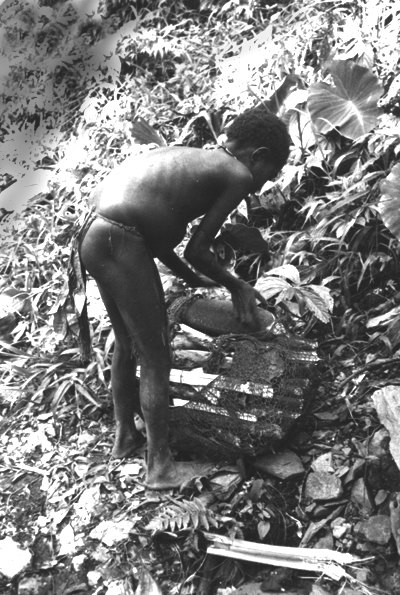 049-26: Tukume tops off her load of firewood with one komba fruit. 049-29, 049-30, 049-31: Tukume slings her loaded bilum onto her head with a well-practiced twist. 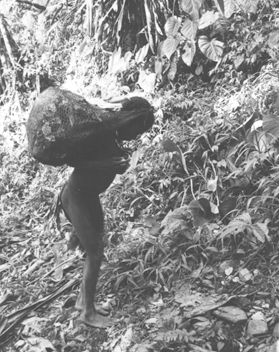 Allison: "When I had first arrived, it never occurred to me that I would not soon be carrying my own belongings in a bilum like all the other local women. My first try was strongly discouraged, however, not by the Maring themselves, but by Annie and Cherry. They had heard that women who had not grown up with this practice usually suffered from neck problems if they insisted. Seeing the practiced twist whereby a heavy bilum was slung from the top of the head, I decided not to fly in the face of this advice. I was used to the twist needed to get a backpack over my shoulders, but in the hot climate, backpacks were uncomfortable. I settled for a very small bilum in which I could carry my notebook and extra film, and I slung it over one shoulder - like a Maring man." Back in Minme's yard, Tukume had a brief smoke after the long hike uphill. Gomb, Minme's younger daughter, had been sent to fetch a huge k9m9r (the character "9" represents the sound of "uh" as in "the" and as in "but") from a neighbor. The k9m9rs were made of light-weight, flexible bark and provided a surface for working with the leaves both before and after they were steamed. 050-25: Gomb brings a k9m9r into her mother's yard. Allison: "I often think back about Maring food and cooking while washing salad and greens in the sink of my European kitchen, and I am amazed at how carefully the Maring greens were bundled. Although they were never washed, and food preparation took place at ground level, there was never any grit in the food." 050-28: Gomb and her little brothers look on while the older girls begin to sort leaves. 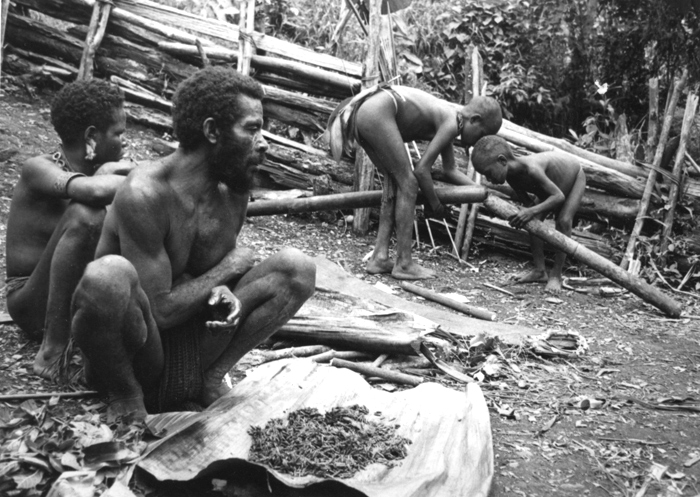 After a few puffs, Tukume had passed the cigarette on to Kum and they both set about to get the leaves ready to be steamed in the earth oven pit inside Minme's house. 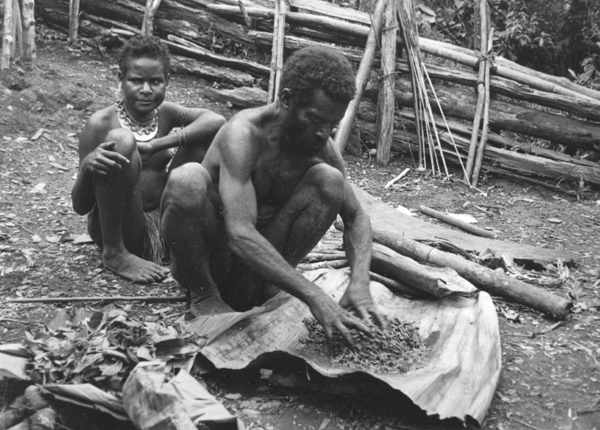 Later the leaves would be mixed with the komba sauce. Across the yard, Kum's older brother, Gonda, was preparing his own food. 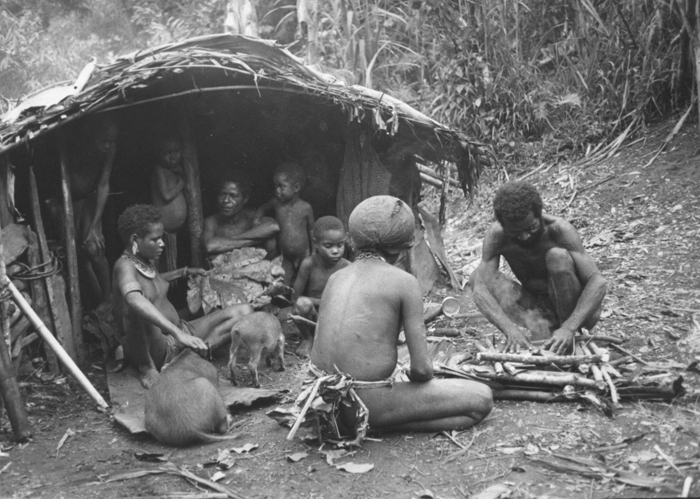 He was newly married and still wore the full head of hair of a young man, neatly covered with a barkcloth cap. 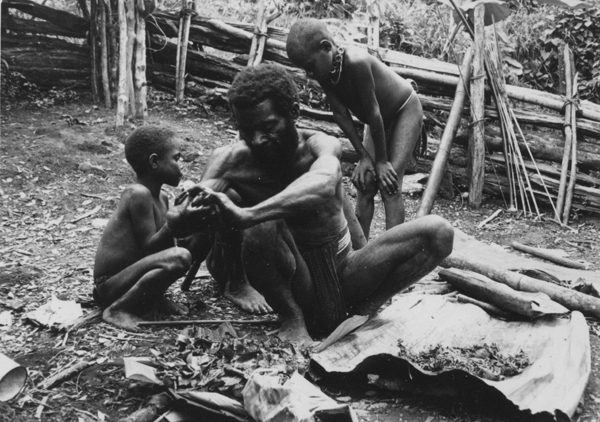 His wife, Kant', was from Fogaikump and belonged to the Kono lineage. 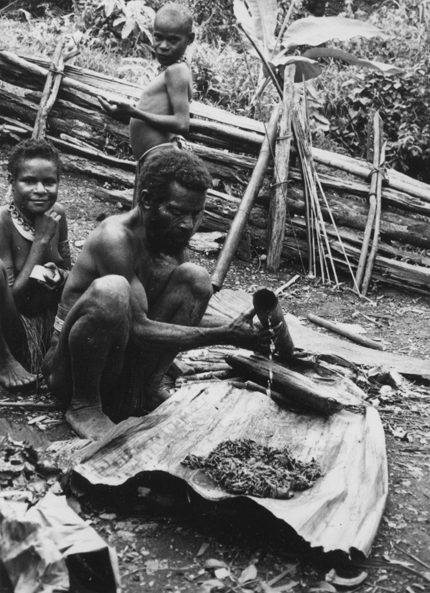 As he had to follow the food taboos separating his lineage from the Kono lineage, he had to cook his food separately from the rest of the family. 051-11: Gonda shakes komba seeds into a banana leaf carefully propped up with a stick of firewood. The seeds, steamed the day before, were now to be used to make a sauce for the greens. 051-12: Gomb and Kum return with water from a nearby stream. 051-17: Mbera and Danigi transfer water into the smaller nink mung - water bamboo. Allison: "Pouring water from one bamboo requires patience and skill. If the tube were tilted ever so slightly too much, all the water would slosh out in a quick flood. The boys helped their mothers do this chore, but could be roundly scolded if they spilled any. As I was always busy with the camera, it never occurred to me to even try my hand." 051-18: Numbi waits for the water so he can start mixing the komba seeds with water and salt. 051-23: Behind her father, Kum snacks on a hot tuber that has just been roasted over the fire in Minme's house. 051-21: Numbi mixes water, salt and komba seeds to get as much sauce off the seeds as possible. 052-22: He squeezes handfulls of dripping wet seeds over the pile of greens. The result is komba aruk - greens with komba sauce. 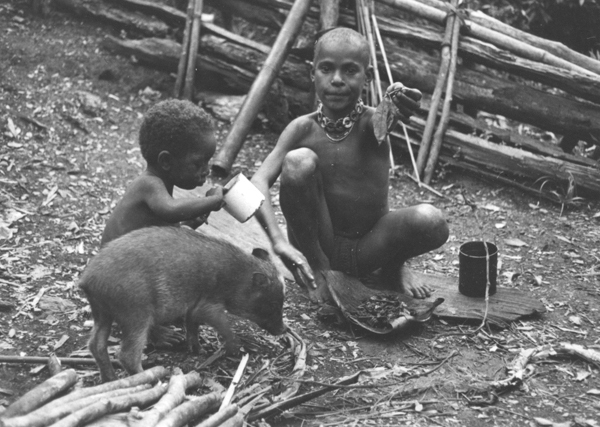 By the time the komba aruk was mixed, the whole family had gathered at Minme's house. 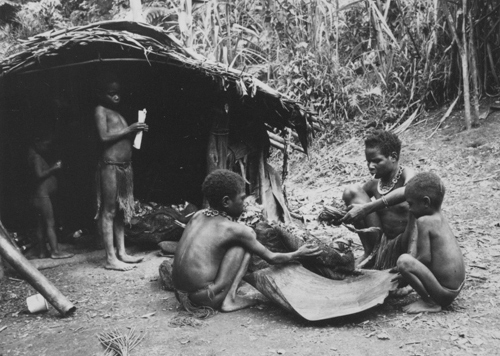 Numbi and Gonda built a small above-earth oven to cook Gonda's food separately. 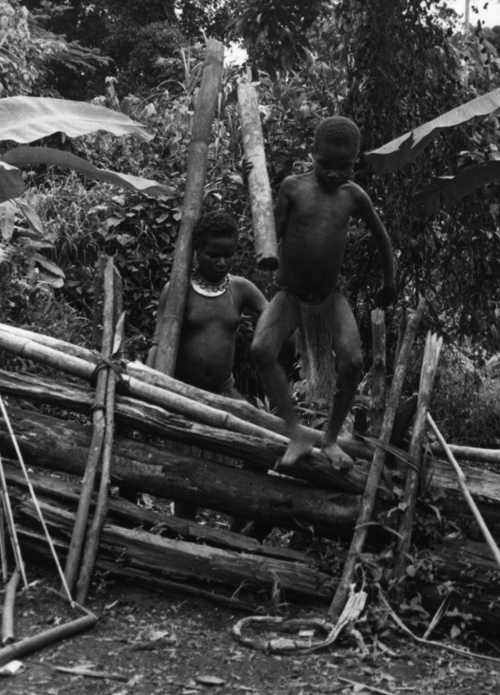 Minme came to the front of her house and sat by the center pole with her two youngest boys, Danigi and Para. Kum was petting the young pigs that had wandered home from their day of foraging in the forest. 051-35: Minme has come to the front of her house and is sitting by the center pole with her two youngest boys, Danigi and Para. Kum pets the young pigs that have wandered home from their day of foraging in the forest. Allison: "Mbera teased me by offering me a piece of komba waq - the bright red, delicious, oily, salty tissue at the core of the komba fruit." 051-37: Mbera offers Allison some komba waq while Para looks hopefully in the family's one enamel cup. Mbera has mixed his own small portion of komba, using water from an empty cocoa tin. Allison: "Mbera knew perfectly well that I wouldn't accept anything to eat as long as I was taking pictures. He also knew that Marek would never eat any komba. 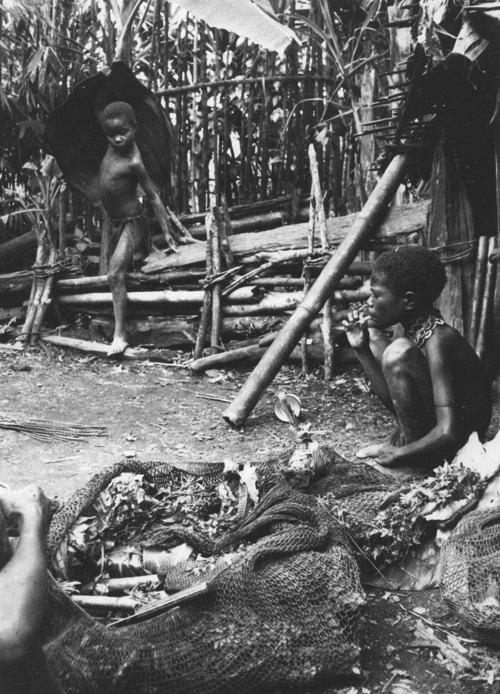 "The very first time Marek had seen komba being eaten, he took a permanent dislike to it. The procedure involved taking a mouthful of the oily seeds, sucking the oil off, and then spitting the now white seeds out into one's hand or onto a leaf. The seeds would then be thrown to an appreciative pig waiting eagerly for the treat. "But Marek couldn't get it out of his mind that the white seeds looked just like a mouthful of teeth being spit out. He never did learn to enjoy this delicious food. It was really too bad!"